2018-2019 Biography | Juho Pohjonen | Kirshbaum Associates Inc.
Juho Pohjonen is one of today’s most exciting and vibrant instrumentalists. The Finnish pianist performs widely in Europe, Asia, and North America, with symphony orchestras, in recital and chamber music. Pohjonen is also an ardent exponent of Scandinavian music and his growing discography offers a showcase of compositions by Finnish compatriots, including Esa-Pekka Salonen and Kaija Saariaho. 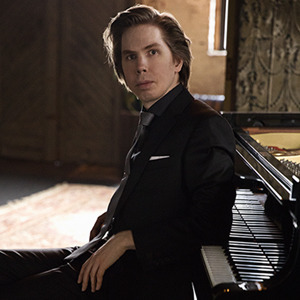 During the 2018-2019 season, Juho Pohjonen appears as soloist with the, Nashville, Pacific, and Bay Atlantic symphony orchestras in performances of the Mozart’s Piano Concerto in A major, K. 488, and performs with the Duluth Superior Symphony Orchestra as soloist in Brahms’s Piano Concerto No. 2 in B-flat Major, Op. 83. He enjoys an ongoing association with the Chamber Music Society of Lincoln Center, appearing with the Escher Quartet in performances of the Mozart Piano Concerto in A major, K. 414, in New York’s Alice Tully Hall and Chicago’s Harris Theater. Pohjonen also performs with the Chamber Music Society in works by Prokofiev and Beethoven with violinist Angelo Xiang Xu, in New York and a tour to Madison, NJ, and Chicago. He collaborates with members of the Calidore Quartet in Beethoven’s Piano Trio in G major, Op. 1, No. 2, at the Wolf Trap Foundation for the Performing Arts in Vienna, Virginia. Juho Pohjonen opens the season in a duo concert with Swedish cellist Jakob Koranyi, with whom he appears in Mälmo and undertakes a European tour in February. Other highlights of Juho Pohjonen’s 2018-2019 season include his recital debut at the 92nd Street Y in New York in a program that features Scriabin’s Eighth Sonata and Dichotomie by Salonen. He gives concerts in Alicante, Spain, the Lane Series of the University of Vermont, and Music Toronto, in repertoire that includes keyboard suites by Jean-Philippe Rameau alongside late works by Mozart and Beethoven. Highlights of Mr. Pohjonen’s summer 2018 schedule included his much anticipated debut with the Pittsburgh Symphony and appearances at the Marlboro Music Festival, La Jolla Music Society SummerFest, and Tannery Pond Concerts in Chatham, New York. During the 2017-2018 season, his concerto performances included the Saint-Saëns’s Concerto No. 5, Op. 103, Salonen’s Piano Concerto, and Einar Englund’s Piano Concerto No. 1, with the Greenwich Symphony and with the philharmonic orchestras of Turku and Tampere in Finland, respectively. In recital, he appeared at the National Gallery of Art in Washington, DC, Frederic Chopin Society in St. Paul, Meany Center for the Performing Arts at the University of Washington, La Jolla Music Society, Perimeter Institute in Waterloo, Ontario, Mobile Chamber Music Society, and Philip Lorenz Memorial Keyboard Concerts in Fresno. As an artist with the Chamber Music Society of Lincoln Center, Pohjonen performed in New York and on tour in Chicago, Birmingham, Asheville, Purchase, Athens, and Ashland, and abroad in Beijing, Seoul, and Taiwan. Juho Pohjonen has previously appeared in recital in New York’s Carnegie Hall and Lincoln Center, at the Kennedy Center in Washington, DC, and San Francisco, La Jolla, Detroit, and Vancouver. He made his London debut at Wigmore Hall, has given recitals throughout Europe—Antwerp, Hamburg, Helsinki, St. Petersburg, Warsaw—appeared at festivals in Lucerne, Savonlinna, Finland, Bergen, Norway, and Mecklenberg-Vorpommern in Germany, as well as the Gilmore Keyboard Festival. Pohjonen has performed as soloist with the Los Angeles Philharmonic, San Francisco Symphony, Atlanta Symphony, Buffalo Philharmonic, and Mostly Mozart Festival, and with orchestras throughout Scandinavia, including the Danish National Symphony, the Finnish Radio Symphony, Helsinki Philharmonic, Avanti! Chamber Orchestra in Finland, and the symphony orchestras of the Swedish Radio and Mälmo. Elsewhere, he has performed with the National Arts Centre Orchestra in Ottawa; in the United Kingdom, with the Philharmonia and Scottish Chamber Orchestra, Bournemouth Symphony; Zagreb Philharmonic in Croatia, and toured Japan with the Lahti Symphony Orchestra. Mr. Pohjonen has collaborated with today’s foremost conductors, including Marin Alsop, Lionel Bringuier, Marek Jankowski, Kirill Karabits, Esa-Pekka Salonen, Markus Stenz, and Pinchas Zukerman, and has appeared on multiple occasions with the Atlanta Symphony and music director Robert Spano. Juho Pohjonen’s newest recording with cellist Inbal Segev features hallmarks of the Romantic repertoire: cello sonatas by Chopin and Grieg, and Schumann’s Fantasiestücke. His debut recording Plateaux, on Dacapo Records, featured works by Scandinavian composer Pelle Gudmundsen-Holmgreen, including the piano concerto titled Plateaux pour Piano et Orchestre, performed with the Danish National Symphony Orchestra and conductor Ed Spanjaard, and the solo piano suite For Piano. His recital at the Music@Menlo 2010 festival was recorded as part of the Music@Menlo Live series. That album, entitled Maps and Legends, includes Mozart’s Sonata in A major, K. 331, Grieg’s Ballade in the form of Variations on a Norwegian Folk Song in G minor, Op. 24, and Handel’s Suite in B-flat Major. Pohjonen joins with violinist Petteri Iivonen and cellist Samuli Peltonen to form the Sibelius Trio, who released a recording on Yarlung Records in honor of Finland’s 1917 centennial of independence. The album, described by Stereophile as “a gorgeous debut,” included works by Sibelius and Kaija Saariaho. Juho Pohjonen began piano studies in 1989 at the Junior Academy of the Sibelius Academy in Helsinki. He continued work with Meri Louhos and Hui-Ying Liu-Tawaststjerna at the Sibelius Academy from which he obtained a Master’s Degree in 2008. In addition, Mr. Pohjonen participated in the master classes of distinguished pianists Sir András Schiff, Leon Fleisher, Jacob Lateiner, and Barry Douglas. Pohjonen was selected by Schiff as winner of the 2009 Klavier Festival Ruhr Scholarship and is an alum of The Bowers Program (formerly CMS Two). He is a prize winner of international and Finnish competitions, including first prize at the 2004 Nordic Piano Competition in Nyborg, Denmark; first prize at the 2000 International Young Artists Concerto Competition in Stockholm; a prize at the 2002 Helsinki International Maj Lind Piano Competition, and the Prokofiev Prize at the 2003 AXA Dublin International Piano Competition.